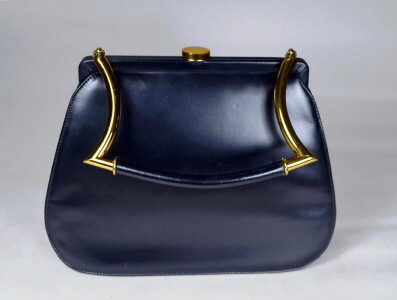 Tailored 50's vintage handbag. Black smooth leather and red soft leather lining. Trim black leather tradition purse. Self covered frame opens wide at sturdy hinges. Wide gusseted sides. Sculpted rigid gold metal handle with leather inset top. Gold metal flat oval snap clasp. Red leather lining with side pockets piped in gold. Large red leather coin purse. Red leather backed lipstick mirror. Fine quality, trim afternoon suit type handbag. Length bottom - 9 1/2"
Width at bottom - 3"
Excellent condition. Shows light wear & discoloration to handle, otherwise great shape!